It feels funny for me to be sharing this colour with you right now, since Essie's Bangle Jangle is actually a shade from their 2011 Holiday collection. But the colour just screams Spring to me! Bangle Jangle is a lovely creme shade of lavender, with a smooth formula and very easy application. The colour is fully opaque in two thin coats, and wears well for over 5 days. I wore this colour on two separate occasions, just to put some variation out there. Bangle Jangle worn with Sephora by OPI's Flurry Up on the ring finger above, and topped off with Essie's Shine of the Times down below. I still am obsessed with flakie effect - love that this particular topcoat shines orange, yellow, and green all at different angles. And to finish off, the winner of the Christina M. Boutique giveaway is Allison! I have sent you an email, please respond within 48 hours! ooooh I really love this color. It's very spring-y, and with the glitter it's perfection! ohh i completely agree with you!! it's a very Easter egg color if i may say so!! haha :p i love the splash of glitter! I love the colour, Andrea! Looks great with Shine of The Times over it. love this color and your blog too!I follow you and hope you can check my blog and if you like I'm very pleased if you follow me too! Lovee the colour and also the glitter :) ! 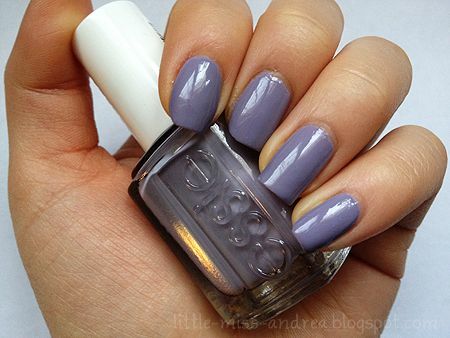 Hi Andrea, I heart this color! So pretty! I tend to wear my polishes with Sephora's sparkles too, for some reason they tend to stay on longer. Also, is there a trick to avoid the bubbles? Thanks for the tip! I get it now. I never wait till my nails are fully dry. Haha! Such a pretty colour - I love purples :) Formula looks really creamy and glossy. 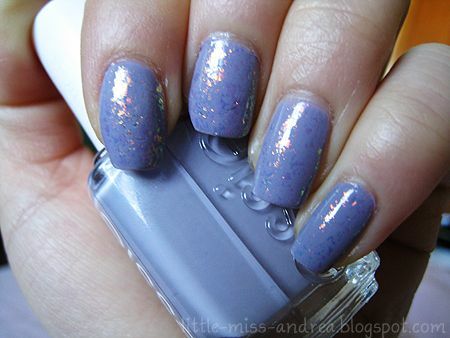 Flurry Up looks gorgeous as a top coat for that accent nail as well. love the color and adore the flaky effect on the one finger! thats such a pretty color! Seriously great color. Such a great blog! oh my gah...I love that lavendar color..so pretty! and perfect for spring...the sparkle is a nice touch! Hi.. beautiful color .. I find it fine..
How have I missed this color? Need to remedy that stat. Andrea, that color looks awesome on you. Looks like a bluish gray! Love the added sparkle. That color is amazing and looks great on you dear! Love it! 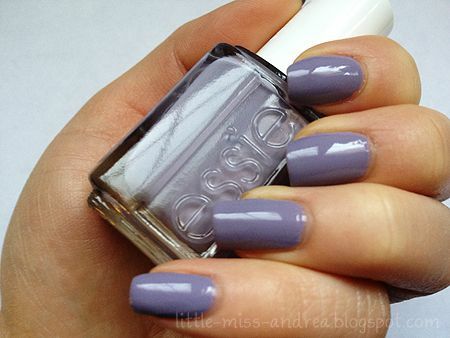 oooh such a pretty dusty lilac shade! i really like the one nail accent with bigger glitters. fun! oh, awesome! love the colour so much! The Office x Essie Polish?